There is something exotic about chocolate covered strawberries. E-liquid Strawberry-Chocolate takes the sweet taste of summer fruit and mixes it with glamorous chocolate. You can have breakfast and dessert all in one with this delicious blend. 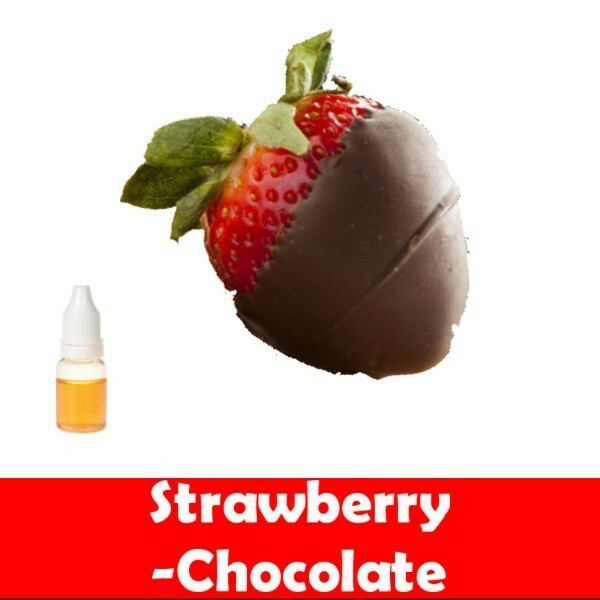 Taste the juicy, sweet strawberry mixed with the rich, appetizing chocolate and hold on tight - it’s a bit like cheating on a diet, but without the guilt. When e-cigarettes were first launched in China in 2004, users were naturally apprehensive about what impact they would have on their health. With time, the electronic version of the tobacco cigarettes won over both the hearts and lungs of users as these are now available in nicotine free formulae as well. Their sale and advertisement has been legalized in various countries like Germany, Hungary, Ireland, and Portugal, to name just a few. The e-cigs work with a clearomizer function in a way that is akin to the working of oil lamps, where the wick feeds oil to the fire, and it keeps burning as long as there is oil to use. The clearomizer contains the e-liquids, which are drawn up through a wick as a person inhales them. The liquid is then passed through a metal coil that heats up when inhaling and converts the liquid to vapour, giving a person the same sensation of smoking only without the ill effects associated with it. Cartomizers use a filling material to send the e-liquid to the coil. The e-liquid is the key ingredient of any e-cigarette because it is the liquid that turns to vapour when it comes in contact with the heated coil embedded within the atomizer. E-liquids, also called e-juices, are made for the hedonistic because they come in different flavours like Cranberry, Raspberry, Blueberry, Green Apple, Pineapple and more. For the quirky, there are flavours such as Cinnamon, Peppermint and Menthol. For others who have a soft spot for the citric, there are flavours such as orange and lime. One can choose from a wide array of flavours depending upon personal preferences and mood. The core substances that produce flavour in electronic cigarettes are propylene glycol (PG), used in food products, and vegetable glycerin (VG), a sweet viscous liquid, along with other flavouring agents. When these are used in combination, they give out a rich and smooth flavour that people who puff on the e-cigs come to enjoy. A smoker can choose from a range of e-liquid strengths – they are available in different concentrations like light, regular, strong etc. to suit tastes of different individuals. E-cigarettes, which have gained immense popularity, are used by over 2 million people all over the world. Part of the popularity is due to the different flavours that people can enjoy while inhaling an e-cig.